t was a beautiful Thursday morning, last May 23, when the phone rang in the rectory at St. Ann's Church in West Bridgewater. The Rev. Edward McDonagh was preparing the bulletin for that Sunday's service. On the line was an official of the Boston Archdiocese. The office had received an allegation that McDonagh had sexually abused a boy at his first parish nearly 40 years ago. Would he please report to the chancery the following day? ''I remember replying, `You know, my life has just ended,' '' McDonagh recalled recently. ''I went to a friend's home and just cried.'' The next day, after the meeting in which they gave him the name of the alleged victim, church officials ordered McDonagh out of the rectory where he had lived for nearly 12 years. He gathered some belongings in a suitcase and left before his parishioners knew what had happened. It was a journey of soul-searching that took him through various stages, beginning with anger and grief and ending, he said, with peace and understanding. His personality has changed, too. A self-described shy man, he would always decline to socialize with his parishioners; he was mostly business. Today, he readily embraces them -- patting backs, hugging, shaking hands -- like a politician on the campaign trail. McDonagh was officially reinstated a week ago, after being cleared by the archdiocese's sexual abuse review board. He is the first parish priest to be reinstated; 23 others await their verdicts. Monsignor Michael Foster, a canon lawyer, was cleared in November. McDonagh seemed overwhelmed. ''I can't thank you enough for your perseverance and trust in me these past nine months,'' he told them. He added, as parishioners giggled: ''I don't know if this is what a woman experiences after she carries a baby for nine months. My sense is one of great relief and joy.'' In the parish hall afterward, parishioners signed a guest book and ate from tables groaning with goodies they had made. During Mass, McDonagh said he had found peace through reading and rereading Cardinal Joseph Bernardin's ''The Gift of Peace.'' 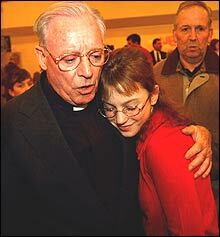 Like him, Bernardin, archbishop of Chicago, had been accused of sexual abuse. Both priests were 65 years old when they were accused. Both accusers had died of AIDS. And both priests were eventually cleared. In fact, the man who accused McDonagh died six years before the complaint surfaced. In a letter to the archdiocese, the man's sister claimed McDonagh had abused him in 1964 at the Incarnation Church in Melrose, McDonagh's first assignment after graduating from St. John's Seminary in Brighton. McDonagh says he does not recall the accuser. In her letter, the sister detailed her brother's history of substance abuse, psychiatric problems, and life as a prostitute, ending with his 1996 death from AIDS. When the archdiocese first placed him on paid leave, McDonagh said he was furious: ''I screamed and cried and hollered and hit the wall.'' He was also naive. He didn't take an attorney to the meeting with church officials. He was not given a copy of the letter of complaint against him. In the meeting, he denied the allegation and expressed displeasure that his parishioners had to learn of the ordeal on the evening news, instead of from him. Then there was the more immediate issue. Where would he go? ''Do you expect me to live in my car?'' he asked them. He was assured that he could get a hotel room and the archdiocese would pay for it. For several months, McDonagh lived in a hotel in nearby Brockton, where he became a regular at a couple of restaurants and coffee shops. The archdiocese had asked him to stay out of West Bridgewater and told him he could no longer wear his clerical collar or perform any priestly duties. That first week, he lost seven pounds. His doctor told him he had to eat and recommended a protein drink. He also went, unnoticed, to Mass at St. Gerard Majella Church in Canton, where the outspoken priest, the Rev. Bernard McLaughlin, was an early critic of Cardinal Bernard Law and his handling of the abuse scandal. McDonagh, too, had been publicly critical of Law and had informed archdiocesan officials last March that his church would not participate at that time in the Promise for Tomorrow fund-raising campaign. From the pulpit, he rescinded his oath of obedience to Law and got a standing ovation. Soon after, he was removed from the church -- an action that his parishioners are certain was retaliation. The abuse complaint was received in March; McDonagh wasn't suspended until May, shortly after his critical homilies. McDonagh doesn't necessarily see a conspiracy. ''They got a complaint, and they had to deal with it,'' he said. ''They were getting hammered by all sides.'' He is quick to add, though, that his case ''could have been handled more expeditiously'' And he said he's pleased that the old ''zero tolerance'' approach toward accused priests will be replaced March 1 by more due process, with written guidelines. McDonagh is a priest out of the old school. He is courtly and quiet, seems most at ease wearing his collar (''It's who I am''), and calls celebrating the Eucharist ''the center of my life.'' Growing up Irish in Jamaica Plain in the 1940s and '50s, he went into the priesthood in part because of the culture. ''It was very difficult to advance in the business or education fields,'' he said. The seminary entrance exam was given over two days, so he would take the test during the day, then rush over to St. Thomas Aquinas High School, where he'd sing ''That's Amore!'' to a ''beautiful blonde'' in the school play. When he was accepted to seminary, his mother was thrilled. ''Every Irish mother prayed that one of her sons would become a priest so when she died she would have someone to pray for her,'' he said. Throughout McDonagh's ordeal, his parish stood behind him, holding a prayer vigil every Sunday night for his return. They stuck lawn signs around town: ''We Support Father McDonagh.'' Not a day passed when he did not receive a card or letter from one of them; some sent $5 or $10 bills. 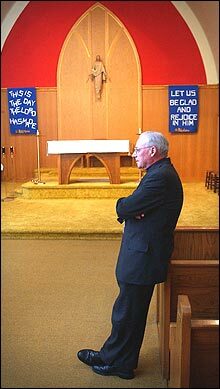 When a representative of the archdiocese came to meet with parishioners just after McDonagh's removal, they nearly drummed him out of there, refusing to let him speak. They raised money for an attorney, but parishioner David Sorrenti insisted on representing McDonagh pro bono. Still, there wasn't much even the lawyer could do except ''make noise'' -- and wait. The archdiocese did not return McDonagh's calls. On the two occasions that a bishop called to see how he was doing, McDonagh said, ''Get me back!'' Meanwhile, a revolving door of priests assumed his duties, led by the Rev. Francis Cloherty, vicar of Brockton. Three weeks ago, McDonagh was called to a meeting with Bishop Richard Lennon, Law's temporary successor. The priest was nervous; he'd had no indication of which way the investigation was going. ''I was either going to be restored or looking for a job.'' After some small talk, Lennon told him that the review board had found the allegation unsubstantiated. According to canon law, the complainant had 10 more days to appeal the decision to the archdiocese and 15 days to appeal it to Rome. She did neither. A decree restored McDonagh to active ministry on Feb. 14 -- 41 years to the day that he had been ordained. McDonagh expressed joy in his restoration, but there was one more thing he had to do: renew the vows of obedience that he had broken with Law. He knelt before Lennon, put his hands in the bishop's, and pledged obedience. This story ran on page D1 of the Boston Globe on 2/20/2003.